Are you willing to leave the tourist trail for one of NYC’s best museums? New York City has a lot of great museums, but the Museum of the Moving Image is the only museum in New York City that my 7-year-old son enthusiastically recommends. We took him to the Metropolitan Museum of Art, MoMA, and the American Museum of Natural History, and he thought they were good, but the Museum of the Moving Image was the only museum he would have been sorry to miss. 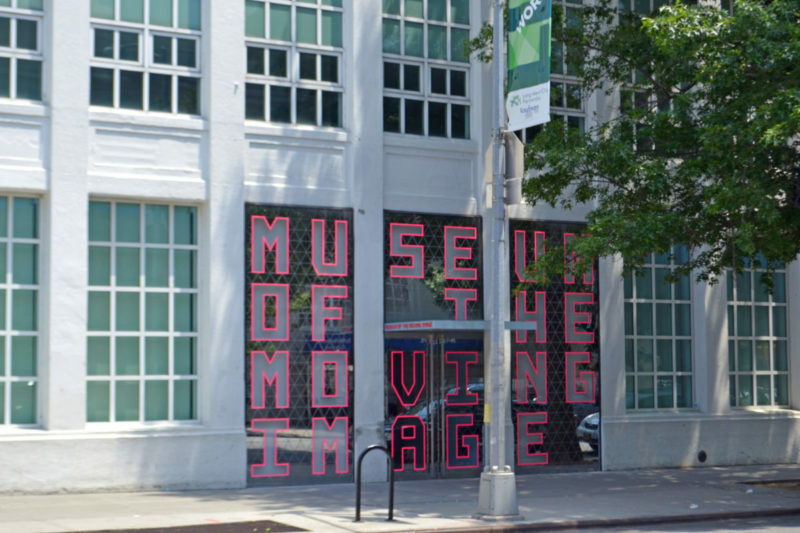 What makes the Museum of the Moving Image so great for families? Read on. The Museum of the Moving Image is a serious museum about the history of film and other media in motion. It is located next door to Kaufman Astoria Studios in Queens where Orange is the New Black, Sesame Street and many other shows are filmed. The museum is made for film snobs, but it’s fun for everyone else too. You don’t have to be a cinephile to appreciate displays of classic video games and Star Wars memorabilia. When we first arrived, the museum’s modern design and an avant garde art exhibition by Jim Campbell made me wonder if we had wandered into MoMA again. I appreciate film as an art form and I enjoy film history, but this exhibit was a little… out there. Then we turned the corner and spotted a zoetrope – a cylinder that makes a strip of still pictures look like they are moving when it spins. My kids know this toy from The Leonardo near our home and they had fun playing with the zoetrope and other optical toys on display. In other parts of the museum we saw famous movie props and learned about special effects, wigs, costumes, soundtracks, television and more. There was a small movie house decorated like the ornate Egyptian movie theaters of the 1920’s where we watched an old Captain America serial film. Captain America has changed a lot over the years. If I were visiting with teens, or without my children, I might have enjoyed the feature-length film screenings that are usually included with admission. The line-up is constantly changing, with classic horror films on show during our visit. The Museum of the Moving Image is a good place to see international, independent or classic films. Some of these films may be appropriate for children, but they are not specifically for families so be sure to learn more before you see a film with the kids. Check the museum’s website to see what will be playing during your visit. The old and venerable museums of New York City hold the treasures of the world, and they are certainly good for families, but there aren’t many exhibits that visitors are allowed to touch, let alone play with. This can be challenging for kids, who learn a lot through play. At the Museum of the Moving Image, we found high tech, hands-on exhibits around every corner. My kids made simple optical illusions called thaumatropes and edited a video game on a MacBook. The Stop Motion Animation station was another favorite. There, you can create a short animated film andthen email it. The hands-on exhibit that really sent my kids (and husband) into orbit was the classic video game arcade. We played Donkey Kong, Frogger, Ms. Pac-Man and more. Purchase tokens for 25 cents each when you pay admission, or there is a token machine near the games. The American Museum of Natural History or the Metropolitan Museum of Art are so large that you can’t see and appreciate the entire museum in a single visit. They are amazing, but they can also be overwhelming. The Museum of the Moving Image is far more manageable. Bonus: if you lose sight of your child, he or she will probably be easy to find. When: The museum is open to the public on Wednesday-Sunday. It may also be open on some Monday holidays. Tuesdays are reserved for groups. See details and hours at www.movingimage.us/visit/hours. Disclosure: We received complimentary admission to The Museum of the Moving Image so that we could review it for other families. All opinions are my own. I think my kids would love this one! I’m glad to know about some of the smaller things that appeal to kids in NYC. Hi Katie, if you want to know about the wonderful things to discover in Queens, contact me at [email protected]. Thanks. Oh we’d TOTALLY love to go there. Thanks for sharing! This museum sounds like so much fun and I’ve never even heard of it before! Pinning to remember for my next trip to NY! I’ve never heard of it. How fun! I’ve never even heard of this museum! Will definitely go on our next trip! That sounds like a great museum! I’ll have to keep that in mind when we’re going to NYC since we might be staying at a hotel beyond Manhattan as well.